Our products and ideas have been featured in Country Living, Sheknows.com, Manhattan Nest.com and ElleDecor.com, All our bedding items are made with the assistance of family owned companies in North and South Carolina and are our original designs. Many items are in stock and ship within 1-2 business days of order receipt, please consult each product for specific lead times. For a custom quote, please contact us via Etsy and we'll happily quote your project in a timely manner. Custom items and sizes are made in 4-6 weeks. Matching fabric by the yard is always available, just ask. Wholesale available to qualified retailers and designers. Please contact us here to open a trade account. We specialize in custom sized bedskirts, duvet covers and special shower curtain sizes for historical and vintage homes and bathrooms. I have contacted the company this morning and I am still waiting to hear back from them. The only response was, I will get back to you shortly. I don’t understand why they aren’t helping me. (1) I wasn’t aware the this curtain is three separate pieces of fabric sewn together. (2) Fabric has a strong cigarette smoke smell to it. Beautiful ticking stripes! Perfect weight, not too heavy but not too light. Looks so cute in my bathroom! These gorgeous red and antique ivory Ticking stripe pillow covers are back in stock! At 18.00 each and Made in the USA you can't go wrong!! You can buy these now in our Etsy shop! Love our ticking stripe throw pillow covers in brown and our ever popular gray. Perfect spring update! A black and white gingham shower curtain selected by one of our fabulous and creative customers. Message us for options! Another custom item headed off to its new home! Our ticking stripe bolster in grey, headed off to its new home. Custom quality at a fraction of the price! Another fun customized shower curtain for a creative customer! In 2008 we set out to create products right here in the USA. I was dismayed at the cost of decorator quality bedding and custom made duvets, it seemed like there had to be a better way. With lots of research, fabric manufacturers and resourcing we made our first batch of shower curtains and pillows and expanded into duvets and bedding and listed them on Etsy. From there Country Living and a few blogs featured our products and some customers even won awards for their projects featuring our items! We are happy to customize and item or size of a product within reason. A customization up charge may apply. Please contact us with a quote request via Etsy or email. Please allow a 24 hour turnaround time for custom quotes. 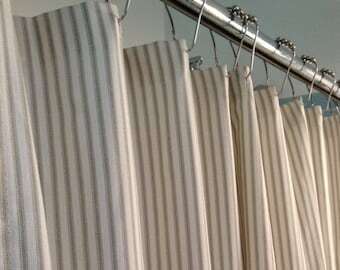 We offer many sizes of shower curtains, pillow shams, bed skirts and duvet covers. Here are some guidelines on sizing. All sizes are stated as width x height and in inches. All our fabrics are 100% cotton. Because of the high quality of our construction and custom cut sizes that arcade to last, we recommend professional cleaning for all our items. If you choose to wash our items please do so with care. Wash separately cold, gentle or hand wash setting line dry or lay flat to dry, iron on coolest setting as needed.